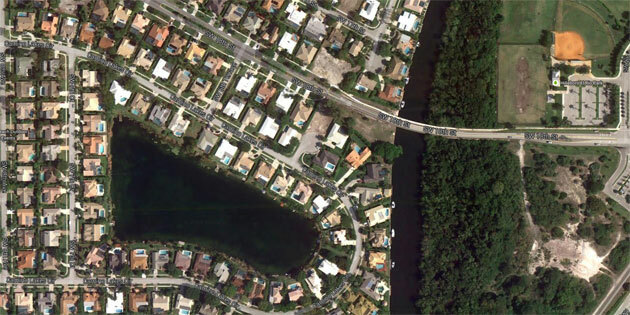 Camino Lakes is a family-friendly, waterfront community located in East Boca Raton, FL. This highly desirable neighborhood is situated around a beautiful six-acre natural lake with charming single-family homes nestled amongst deep water canals. A truly picturesque community, Camino Lakes offers a laid-back South Florida lifestyle surrounded with gorgeous views of the natural tropical foliage and shimmering waterways that lead out to the nearby Atlantic Ocean. Children in Camino Lakes attend some of Boca's top-rated schools including Addison Mizner Elementary, Boca Middle School, and Boca High School, making this community a popular choice for homebuyers with school-aged children. Camino Lakes is a family-friendly waterfront community that provides a diverse selection of custom single-family homes set within a tranquil, tropical setting close to all that Boca Raton has to offer. If you think Camino Lakes would be a great place for your next home, you may want to visit nearby Boca Raton communities including Camino Gardens and Boca Islands which are also highly-desirable East Boca Raton waterfront communities with a family-friendly atmosphere. If you would like to learn more about homes for sale in Camino Lakes, please contact us today at 561-998-9015. You may also reach out to us by completing the simple online contact form provided below, and one of our expert Realtors will be in touch to assist you. We at Champagne & Parisi Real Estate are committed to providing the highest level of professional skill and expertise when working to help our clients achieve their real estate goals. We hope that you will choose Champagne & Parisi Real Estate when you are ready to find your next dream home in Boca Raton!